The Vikings: Very good movie. Has a little bit of everything. Most historically accurate movie I have seen. A must see! The 13th Warrior: A very cool story with lots of action. Weapons and armor aren't very historically accurate, but still a good movie. 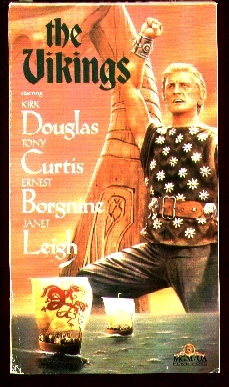 The Warlord: Starring Charlton Heston as a Norman Knight. Erik The Viking: Very funny comedy. The Runestone: This is a horror movie. I didn't think it was that bad. These people dig up this Runestone that sets Fenrir free. He then starts killing people, and the heroes must stop him. The Long Ships: Richard Widmark contends with Moorish prince Sidney Poitier for a fabled golden bell. Didn't enjoy this one at all. Ships were about the only thing historically accurate. Many of the scenes were done in a silly fashion. The Norseman: Lee Majors plays the role of a Viking prince who sails to America in an attempt to rescue his father who is held captive by the native Indians. Not a bad movie. Almost all the Vikings are wearing horned helms, and the weapons aren't at all accurate. But a good story. Viking Massacre: Horrible movie! Couldn't find anything that was "Viking" in the whole movie. Revenge Of The Barbarians: Not a very good movie from a historical Viking point of view. Everybody fights with throwing daggers for some reason. There are some things that are Viking though and the story isn't that bad. The Island At The Top Of The World: Modern day explorers find a remote island with Vikings living on it. Not a bad movie, some funny special effects. Beowulf: Fun movie. Sticks to the original fairly well. That's all the movies that I know of. If anyone knows of any more, please email me or put them on the message board. Asgard-To A Golden Age: Viking themed heavy metal. Crusade of the Berserker, Odhinn Ride, The Way of the Nordic Light, Sons of the Aesirs... Really heavy with cool lyrics. Fast, violent, Sepultura-like music. Thryfing-Valor Galga: Viking themed heavy metal. Storms of Asgard, A Moment In Valhalla, Mimer's Well... Cool lyrics and very heavy. Unleashed-Victory: Viking themed heavy metal. The Defender, Berserk, Scream Forth Aggression... Lots of Viking references in the lyrics. The Defender is just an awesome song. Cover even has a Thor's hammer on it. Unleashed-Warrior: Another great cd from Unleashed. Ragnarok, Hero Of The Land, The End... Very heavy cd, but not as many Viking references as Victory. Unleashed-Across The Open Sea: To Asgaard We Fly, Across The Open Sea, In The Northern Lands... Another cool cd from Unleashed. Really cool cover art on this one. Einherjer-Norwegian Native Art: Viking themed heavy metal. Wyrd Of The Dead, Burning Yggdrasil, Howl Ravens Come... Cool cd with lots of Viking references. Enslaved-Eld: Viking themed heavy metal. 793(The Battle Of Lindisfarne), A Long Time Ago, Fire, Sacrifice To The Elves... Very cool cd. Starts with a cool instrumental. Lots of Norse references in lyrics. Black Sabbath-Tyr: Classic Black Sabbath style metal with Tony Martin doing vocals. The Battle Of Tyr, Odins Court, Valhalla... Good metal cd. Therion- Secret Of The Runes: Great cd. Kind of a classical/metal mix. Very talented band. Hin Onde- Songs Of Battle: One of my very favorite cds. Viking themed heavy metal at it's best.